This 1976 admission by a Labour Prime Minister, James Callaghan, bears testament to the final rejection of Keynesian demand management as the dominant paradigm of macroeconomic policy in the UK. What had gone wrong? William Phillips, a New Zealand economist, had studied records of unemploymentand the percentage change in money wages (taken as a proxy for inflation) in the UK between 1861 and 1957. His conclusion, published in 1958, was that a close inverse relationship between unemployment and percentage changes in average nominal wages existed. As nominal wages (inflation) increased, unemployment tended to decrease. This finding, which became known as the Phillips curve, offered a simple trade-off for economic policy makers in the UK and across the world. 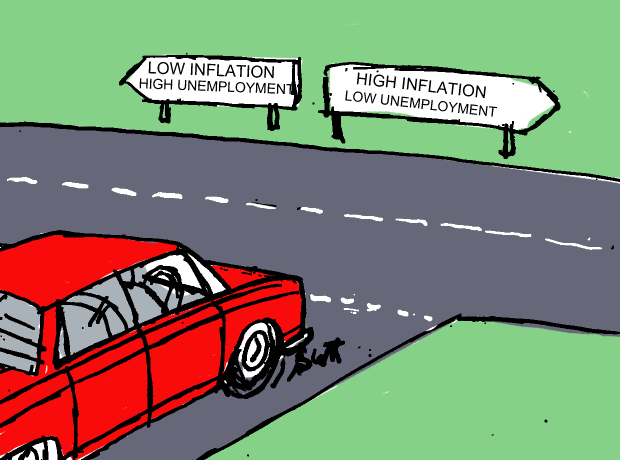 Lower unemployment could be simply achieved by printing more money and increasing inflation. In the 1950s and early-to-mid 1960s, the Phillips curve tended to hold. However, during the 1970s the convenient relationship started to deteriorate with the emergence of stagflation. 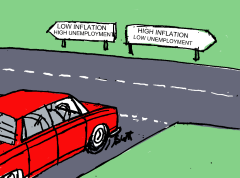 Stagflation is a term given to a situation when both the inflation rate and the rate of unemployment are rising, a result which the Phillips curve suggested was impossible. In the US, for example, between the years 1969 and 1975 inflation rose from 6% to 9%, with unemployment also increasing from under 4% to 8.5%. The explanation behind the breakdown of the Phillip’s curve relationship was best espoused by Milton Friedman who, in 1968, had warned of the potential for stagflation. There are essentially two theoretical schools of thought underlying the Phillips curve – sticky wages and imperfect information. For a firm, it is costly to constantly adjust wages to keep pace with the rate of inflation and therefore, when the price level (inflation) rises, real wages will fall. When real wages fall, labour costs become cheaper and the firm can decide to hire more labour, thus reducing unemployment. With the imperfect information model, it is assumed that firms do not know if an increase in nominal prices is due to a change in real economic fundamentals (i.e. higher demand for their product) or a result of inflation. The firm may increase output (and hire more workers, hence reducing unemployment) because there is a probability that the firm can achieve higher profits. Friedman argued that once economic agents – workers, bosses, trade unions – came to factor the prevailing rate of inflation into wage bargains and output decisions, only by increasing the inflation rate above the previous level could policymakers exert any influence over unemployment. Higher and higher rates of inflation would be necessary to generate even short-term falls in unemployment and that short-term horizon would reduce all the time as expectations adapted to the new expected rate of inflation. The unemployment rate, therefore, could only be reduced through inflation in the short-term, but would have no influencing on long-term rates of unemployment as expectations of future inflation changed. The long-term unemployment rate (technically called the Non-Accelerating Inflation Rate of Unemployment – NAIRU) was called ‘Natural’ and was set by microeconomic factors such as wage flexibility and labour mobility. Restructuring the labour market and enacting key supply-side reforms would come to form the central plank of a new kind of economic paradigm – neo-liberal economics and monetarism. Between the mid-1970s until 2008, the dominance of supply-side economics and neo-liberalism was not seriously questioned by policymakers in the Western world, spurred on by the failure of the Communist system in the USSR and a new wave of rising prosperity.